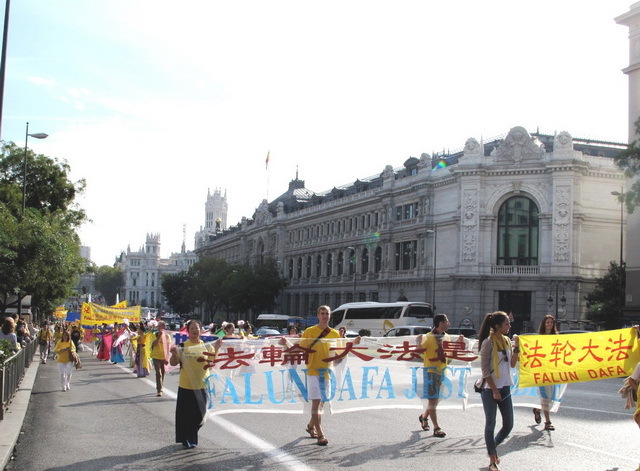 Falun Gong practitioners from over 30 countries in Europe held a parade in Madrid, Spain on October 4, 2014. The parade opened a window to the real China, one that most people have limited access to: a country with a splendid traditional culture, the birthplace of a beautiful and profound spiritual practice that has spread all over the world, yet which is persecuted in its country of origin. Many spectators acknowledged the importance of exposing the persecution and expressed appreciation for the parade's peacefulness and positive energy. One spectator was so impressed that she joined the parade and walked with the practitioners. 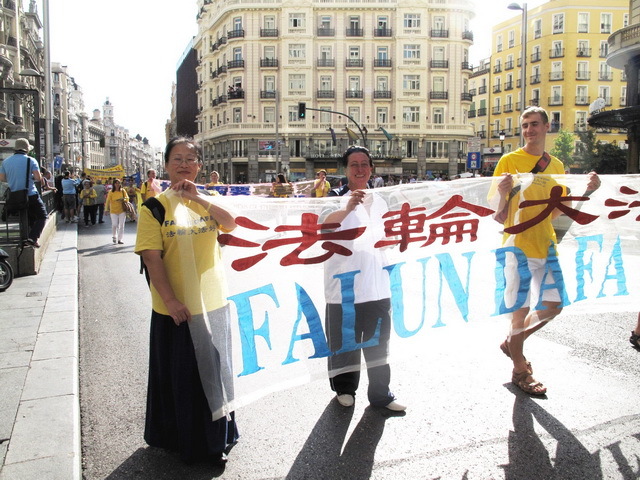 Mr. Euriunne Oms, a businessman in the construction business, said that he and his wife had learned about the persecution of Falun Gong from news reports in the Spanish media. They remarked that the persecution is “undoubtedly horrible.” “The parade is beautiful, well organized and quite peaceful,” Mr. Oms added. The stirring music of the Divine Land Marching Band of Europe led the procession. Following the band came practitioners dressed as celestial maidens, displaying the beauty and grace of Falun Gong. 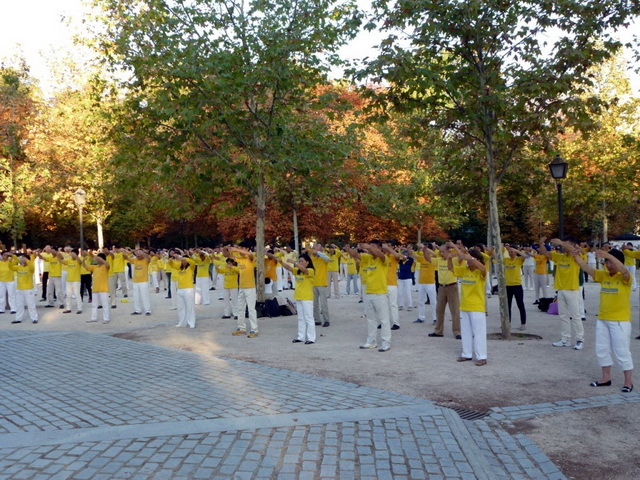 Several sub-themes followed, including Falun Gong's spread throughout the world, a commemoration of practitioners who have lost their lives in the 15-year persecution, a condemnation of the persecution, and support for the millions of Chinese people who have quit the communist organizations. He added that he has lived in the city for many years and had rarely seen any parade permitted on these busy streets near such major national landmarks. 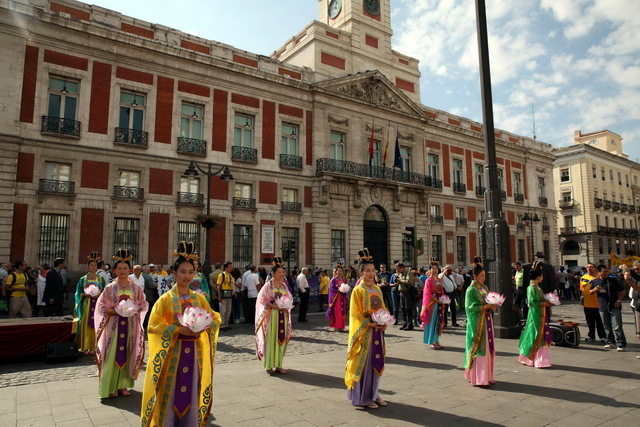 The parade started off from Madrid's landmark Plaza de la Independencia and ended at the Puerta del Sol, the center of the radial network of Spanish roads. 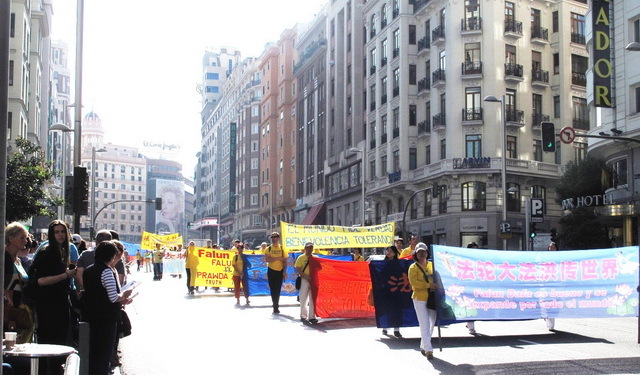 Ms. Maria Angeles, a retired nurse vacationing in Madrid, said that the parade brought her a very positive, strong feeling and that she supported the practitioners' effort to end the persecution. Several Chinese tourists also took in the event and chose to quit the Chinese Communist Party and its affiliated organisations.